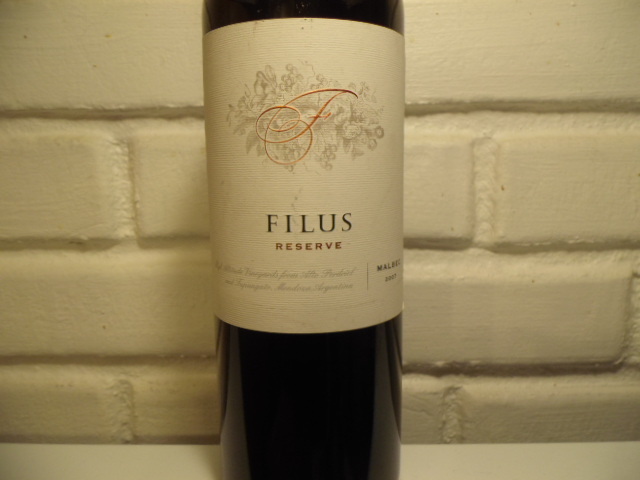 2007 Filus Malbec Reserve | Wine Splash! Inky purple with deep ruby tones. On the nose, black plum, dark fruits, anise, and menthol. Medium to full bodied mouth feel, robust, with some big tannins across the palate. Flavors of ripe plums, tart black cherry, leather, and tobacco spice. A few sips later brought out notes of black currant and a hint of smoke. Lots of heat detected from the tannins on the long finish. Or maybe from the present alcohol which is 13.9%. Pair this wine with a grilled steak, stewed beef, braised lamb, sausage, or medium to sharp aged cheeses. This is a big, bold Malbec with lots of complexity and concentrated flavors. If you like a big, robust wine, this could be your new favorite! We truly enjoyed this wine and give the 2007 Filus Malbec Reserve an 88 point rating. It has aged nicely and still has lots of fruit and structure. The bottle says that the wine should be drank by 2012 but we feel that it will easily last another year or two. WineSplashing! !